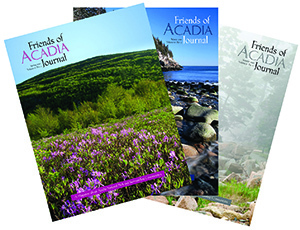 Published three times annually, the Friends of Acadia Journal is the membership magazine of Friends of Acadia. Through informative articles, updates on FOA and park activities, and high-quality photographs, the Journal strives to encourage and deepen readers’ individual relationships with Acadia National Park and promote stewardship of this magnificent place. Friends of Acadia is a membership and volunteer organization, and our work is significantly powered by volunteer effort. The Journal is no exception, and we are grateful to all of the writers and photographers who generously contribute their time and talents to our publication. We love to hear what our readers are interested in reading about. To suggest a topic for a Journal feature, to tell us about a book you think we might want to review, or to alert us to park-related news, please use our submission form. Please note that we cannot consider unsolicited feature story manuscripts. If you are an experienced writer interested in volunteering to write a feature for the Friends of Acadia Journal, we’d love to hear from you. Contact Aimee Beal Church at editor@friendsofacadia.org with some information about your writing background, Acadia-related interests, and any subject expertise you can offer. Letters to the editor can be addressed to editor@friendsofacadia.org, or use our submission form. Letters may be edited for length and style. This series features guest author essays about Acadia National Park and Friends of Acadia. Each issue of the Friends of Acadia Journal will feature a 1-page personal essay written by a Friends of Acadia member, volunteer, or business sponsor who feels a special connection to the park (don’t we all?) and honors that connection in part by being a dedicated FOA supporter. We’re interested in hearing from a wide range of people—usually but not necessarily an Acadia-area resident, enjoying the park in a variety of ways, and supporting FOA and Acadia however feels right to them. Authors may write about what makes Acadia a special place for them, about what role their relationship with this place plays in their life and work, and about how their support of Friends of Acadia ties in to their relationship with the park. Friends of Acadia believes that sharing the many, complex relationships of individuals to the land and spirit which comprise Acadia will develop visitors’ appreciation for the need to care for this fragile place. Note that this doesn’t need to be a “cheerleading” piece for Friends of Acadia, unless that’s an author’s sincere wish—we hope that Acadia National Park, not Friends of Acadia, will be the central character in this series. Essays in this series will be 500-600 words, with a brief author bio of approximately 50 words, a photograph of the author and, if possible, an Acadia photograph relevant to the essay. To propose an essay for the “Why I’m a Friend of Acadia” series, please contact Aimee Beal Church at editor@friendsofacadia.org with a brief description of why you’re interested in writing it and what you’d like to say. Please do not submit completed essays without prior acceptance. Publication will be based on available space and creating a mix of people and perspectives for the series. The Friends of Acadia Poetry Prize was awarded biannually from 1998 through 2012 to promote and recognize distinctive nature poetry. We regret to announce that the Friends of Acadia Poetry Prize has been discontinued as of 2014. We are no longer able to accept submissions of poetry. Thank you to all who sent their work in past years and gave this Prize such a good run. We hope you will continue to write fine nature poetry and promote an appreciation for the outside world through your work. We gratefully accept donations of reprint rights to high-quality scenic photographs taken in Acadia National Park, for use in the Journal and other Friends of Acadia publications. Publication preference is given to current members or volunteers of Friends of Acadia. We will credit you as photographer in the publication (generally adjacent to your photograph). Electronic publications can include a link to your website or other URL of your choice. To submit photographs via mail, please mail high-resolution digital files on disk to: Aimee Beal Church, Editor, Friends of Acadia Journal, PO Box 45, Bar Harbor, Maine, 04609. Please indicate whether we may use your photograph(s) in the Journal only, or in all FOA publications. We will notify you if/when your photo(s) are selected for publication. If you have questions, please contact Aimee Beal Church at editor@friendsofacadia.org. I affirm that I am the photographer and hold all legal rights to this photo, and that I have the permission of any people appearing in it to submit it to this site for the purposes indicated here. Neither Friends of Acadia nor any member of the Freinds of Acadia staff shall be responsible for any claims, legal or otherwise, made in regards to photos I choose to submit.